Very Good. 0571298842 ALL BOOKS SHIPPED WITHIN 1 DAY OF PURCHASE! Interesting writing style. As told by individual characters...mostly the children of different ages. Parts are chilling and thought provoking. This is a huge tale woven together using the Congo as a backdrop. The Congo is a place of many stories and this is the story of one families journey through Africa. There is mystery, tragedy, loss, love and the finding of oneself. It is a coming of age story. it's about four young women and their mother being taken from their comfortable, well known environment and throwing them into a hotbox, in which they have to re-learn how to live and survive. I would recommending reading this book as one of this decades contemporary writers. But I can understand why the author could not see this made into a two hour movie. There is just too much content to fit into that format and the climax is in the middle of the book. I read this book years ago and still remember it as one of the best books I have ever read. I will likely read it again--which is rare for me-- but I remember the beauty of its prose and the power of the story and know that this is one book well worth reading and re-reading to capture its richness. I think that those who don't "get" this book are the less-thinking and less-educated readers. No insult intended, its just that this is a BIG story by a great author and those who would enjoy the book most need to be at a higher level of reading and comprehension than the average reader. I did not know some of the political happenings in the Congo at the time this book was set in. 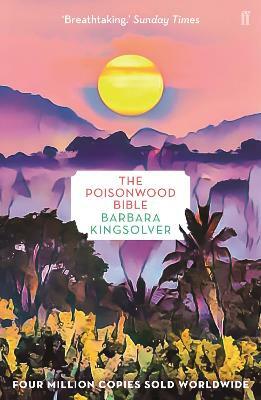 But I love Barbara Kingsolver's way of writing and it was a satisfying story. It gave a personal touch to an African way of life that I would have no knowledge of if I had not read it. In the 1960's Nathan Price, a Baptist minister, drags his family from Georgia to the Congo with the intent of converting the native "heathens" to Christianity. Arriving in the steaming jungle, they find themselves woefully unprepared to live there. Nathan's insistence on bringing the Congolese to Jesus without understanding them first is ultimately doomed to failure. The story is told in five voices: those of the mother and four daughters (three teens and a five-year-old), each with their own distinct style and personality. The different ways in which they all try to adjust to their new situation in a tiny African village is a telling story all by itself, humorous and tragic by turns. When political turmoil causes all the other missionaries to leave Africa, Nathan Price stubbornly refuses to go. His inflexibility and religious zeal bordering on fanaticism alienates the villagers and eventually his own family as well. I absolutely love this book. It is brilliantly written. The language use is beautiful, the characters very realistic. It is a strong and vivid portrait of Africa in a time of struggle for independence. This is the kind of book that makes you really think. Each time I read it there are new details and things to ponder that I didn't notice before. It has some heavy themes, but the wry humor and wonderful descriptions of Africa and its people make it a joy to read.